In late October, the House passed a “bipartisan tweak” to the Dodd-Frank bill Congress earlier passed off as “reform” after the banksters nearly crashed the financial system in 2008. H.R. 992, the Swaps Regulatory Improvement Act, authored primarily by Citibank lobbyists, will allow predatory Wall Street financial institutions to once again engage in high-risk derivatives trading. Losses will be socialized and paid for by the American taxpayer through the Federal Deposit Insurance Corporation or FDIC. Wall Street lobbyists targeted House Democrats. 70 of them came out in support of the bill. Only two Republicans voted thumbs down. They were washed away by overwhelming support for bankster criminality. Hensarling didn’t explain how allowing large banks to play high-stakes blackjack and then force a beleaguered American taxpayer pick up billions in losses will create jobs. Left to their own devices, banksters will create new “unusual or exigent circumstances” Frank-Dodd was supposedly passed to address. Bank lobbyists have successfully rolled back sections of Frank-Dodd and are now working feverishly to institute a return of the heyday of unencumbered derivatives criminality. 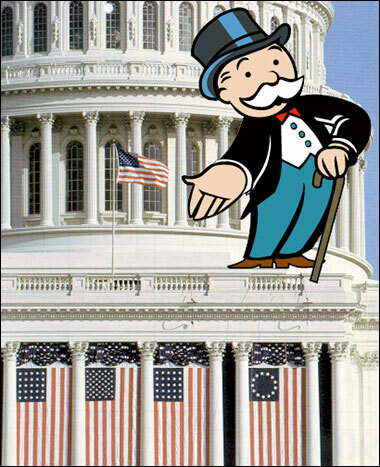 Congress is a wholly owned subsidiary of the bankers and the global elite. The so-called Dodd–Frank Wall Street Reform and Consumer Protection Act signed into law by Obama in 2010 was largely devised as a propaganda device to placate Americans outraged by the “too big to fail” bail-out swindle. Not surprisingly, Dodd-Frank has been left to twist in the wind. As of June, 175 of 279 passed Dodd-Frank deadlines have been missed. Government regulators have neglected 70.1 percent of rulemaking deadlines and 99.6 percent of 280 rules with specified deadlines, according to Bank Credit News. Frank-Dodd was never a serious attempt to “reform” bankster financial institutions. Citibank and the money mobsters have paid off Congress. In turn Congress has given the Mafia dens up and down Wall Street a wink and a nod. No significant reform will be forthcoming.